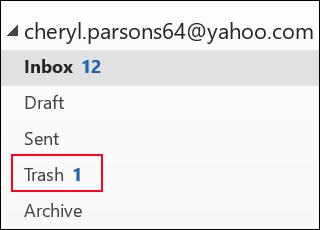 When you accidentally delete an item from your Outlook mailbox, you can often recover it. The first place to look is the Deleted Items or Trash folders. Search for the item you want, then right-click it and select Move > Other Folder. If you can't find it there, the next steps depend on what type of email account you have in Outlook. 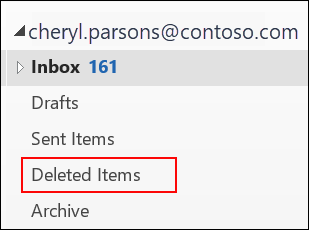 If your folder list looks like this, and you see the Deleted Items folder, see the steps below to recover deleted email, appointments, events, contacts, and tasks that have been removed from the Deleted Items folder. If your folder list looks like this, and you see the Trash folder, you can move items from the Trash folder back into your other folders, but you can't recover items that have been deleted from the Trash folder. Need to recover a deleted folder in Outlook 2013 or Outlook 2016 for Windows? You can recover a deleted folder (with all of its messages) if it's still in your Deleted Items folder—See How. Unfortunately, you can't recover a folder that's been permanently deleted. But you can use the steps in this topic to recover messages from the from the folder you deleted. Delete an item from the Deleted Items folder. Permanently delete an item by selecting it and pressing Shift+Delete. Watch the video or follow the steps listed below the video to recover items from the Recoverable Items folder. In Outlook, go to your email folder list, and then click Deleted Items. Important: If you don't see the Deleted Items folder, but instead see the Trash folder, then your account doesn't support recovering an item that's no longer in your Deleted Items folder. Make sure Home is selected at the top, left-hand corner, and then click Recover Deleted Items From Server. Important: If Recover Deleted Items From Server isn't there, your account doesn't support recovering an item that's no longer in your Deleted Items folder. Select the item you want to recover, click Restore Selected Items, and then click OK.
Where do recovered items go? When you recover items from the Recoverable Items folder, they are moved to the Deleted Items folder. So after you recover an item, you can find it in your Deleted Items folder and then move it to another folder. To help you find a specific item in the Recover Deleted Items window, click the Subject, Deleted On, or From column header to sort items by that column. Note that the Deleted On date specifies when items were permanently deleted (by using Shift + Delete) or removed from the Deleted Items folder. Sort by the Deleted On column to help find messages from a deleted folder if the folder was permanently deleted by using (by using Shift + Delete) because they would all have the same date. All items in the Recoverable Items folder—including contacts, calendar items, and tasks—are represented by the same envelope icon. If you're looking for a contact, sort by the Subject column and look for the name of the person. You can also sort by the From column and look for blank entries because contacts don't have a From field. If you're looking for a calendar appointment or a task, sort by the From column and look for your name. To recover multiple items, click Restore Selected Items, and press CTRL as you click each item. You can also recover multiple adjacent items by clicking the first item, holding down the Shift key, and then clicking the last item you want to recover. Your admin may have specified how long items in the Recoverable Items folder are available for recovery. For example, there may be a policy that deletes anything that’s been in your Deleted Items folder for 30 days, and another policy that lets you recover items in the Recoverable Items folder for up to another 14 days. After this 14 days, your admin may still be able to recover an item. If you can't find an item in the Recoverable Items folder, ask your admin if they can recover it. Unfortunately, if you or your admin can't find an item in the Recoverable Items folder, it's probably been permanently deleted from your mailbox and can't be recovered. Do you need instructions for another version of Outlook? This article is for the Outlook 2010, 2013 or 2016 desktop app. Using something else?